It’s never too early to start setting up your website for holiday season success. The sooner you get started with the tools below, the sooner you can start maximizing revenue both before and during this busy time of year. Here are 5 great BentoBox tools to boost your online business make this holiday season your most profitable yet. The end of summer is the perfect time to start revving up your special ordering and catering options. Bubby’s, a comfort food driven restaurant and pie shop, has had great success with special ordering at their New York locations. 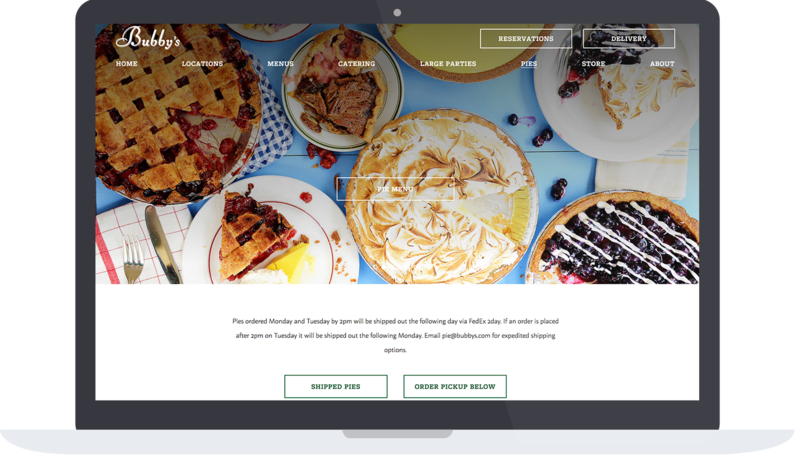 While they offer pie ordering year round, they experience 5x more online pie sales during the holiday season. Melissa Silver, the co-owner of Bubby’s, also says that they have had success offering their pie sales online from the get go. "In the first 4 days our site was live we sold almost $3,000 in pies! We could not be happier." Special ordering page for pies at Bubby's. Sales for gift cards can hit an all-time high during the holidays. At Lilia, an Italian restaurant in Brooklyn, owners Sean Feeney and Missy Robbins found that they sell 68% of their gift cards during November and December. Since they have an online ordering option for gift cards, Feeney and Robbins have also seen that 70% of their gift card sales come from their website, and average about $145 a card. Furthermore, Lilia is often booked solid around the holidays, but offering the purchase of gift cards means that guests can return to enjoy their restaurant year round. To read more about how it all breaks down, check out our recent case study with Lilia and their gift card sales here. 70% of gift card sales come from their website. Set your business up as the host with the most during this party-packed season by offering private bookings online. BentoBox's private event inquiry forms are proven to increase incoming event requests and speed up the booking process. After a guest makes an inquiry, use our management tools to create contracts and collect deposits direcly from your website. 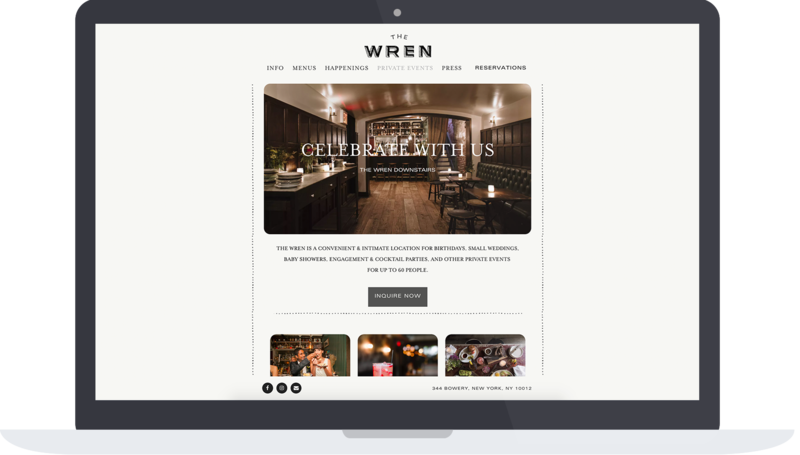 Private events page at The Wren. The tools have been great in getting contracts submitted quickly. Clients are definitely quicker to supply credit card information online. So you’ve got your holiday events lined up and ready, but how do you handle ticket sales? Whether it's a New Year's Eve party, or a special holiday Chef’s dinner, offering tickets puts you in complete control of your event programming from start to finish. Restaurants that use BentoBox's built in ticketing platform profit on average $1,200 a month from those sales alone. This is partially because with BentoBox you can sell tickets directly to your guests, meaning no middlemen or third party fees. Cheers to that. Restaurants that use BentoBox's built in ticketing platform profit on average $1,200 a month from those sales alone. Think about hosting your own special events. New Years Eve, for example, is a great time to offer a special menu. From 2012 to 2015 Google Trends has seen a 43% spike in searches for “new years event menu”. Guests are on the lookout for these seasonal events, and with BentoBox’s Pop-up Alert feature, your audience will know about your shindig the moment they click on your website. Need a little inspiration? Check out the roundup we did of some of our favorite holiday promotions. Now that’s the spirit!